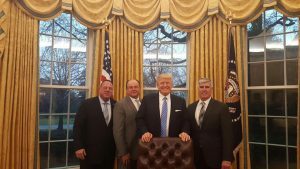 Earlier this week, I was joined by SMART Government Affairs Director Steve Dodd and General Vice President Gary Masino in a meeting with President Trump and Building Trades leaders at his first work day in the Oval Office. Throughout, we were regarded with respect and courtesy. We met with the President to hold a frank and honest discussion about the issues that lie at the heart of what our members and working families have on their minds. Jobs, income security and the ability to get ahead in today’s economy. We commend the President for moving ahead on the issue of foreign trade deals as he promised during his campaign. Our members know that we must get to work on rebuilding our American infrastructure. We look forward to working with the new administration as he turns his campaign promises into new jobs in order to do just that. An investment in our infrastructure wouldn’t just benefit SMART members, it’s an investment in the middle class. It’s not solely roads and bridges—it includes our rail and transit networks, and upgrading schools, hospitals, universities, and energy assets, too. While we have not always agreed with the President or the Republican Party, our union will support what’s best for our members and America’s working families. We’re ready to roll up our sleeves for our Union, the middle class, and the entire nation.